Savvy Spending: Free Junior Cone at Carvel on 5/1! Free Junior Cone at Carvel on 5/1! 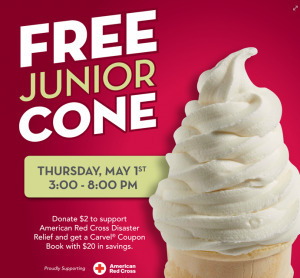 You can get a FREE Junior Cone at Carvel on May 1 from 3-8 pm! You can find Carvel locations here. Valid only at participating locations. One 4 oz Junior soft serve cone per customer. While supplies last. No coupon needed.